…but it also enables you to easily overload and lift the most weight overhead when compared to other shoulder movements(Shoulder Workout Article). However, despite the seemingly straightforward movement pattern of the overhead press, it’s actually quite a technical lift. And if you want to maximize its effectiveness while reducing your risk of injury then there’s a lot more that goes into it than simply lifting a bar overhead. Therefore, in this article I’ll cover the five most common errors people make with the overhead press, and more importantly, I’ll show you how to easily fix them right away. One common overhead pressing mistake is flaring the elbows out throughout the whole movement. This enables your forearms to be positioned directly under your hands like so, leading to a stronger and safer press. And in addition to this, at the bottom position, you need to be initiating the press in something called the scapular plane. Such that at the bottom position your elbows are pointed slightly forward, or in other words at roughly a 30 degree angle from directly sideways. Then only as you press up should you naturally allow your elbows to turn out to the side and then return back to the scapular plane as you descend back down to the bottom position. This has been shown in multiple biomechanical analysis studies to not only be a safer and more comfortable position for the shoulder joint to be in… But also more effective for overhead pressing – which you’ll likely immediately notice yourself after implementing this fix. In order to perform the overhead press most efficiently, the barbell path needs to be as short as possible. But to successfully accomplish this, you need to create space for the bar as you press. At the top position, the bar should now be positioned directly over your shoulders, hips, and feet in a straight line. Avoid excessively sticking your head forward when doing so and also avoid positioning the bar too far back at the top. Instead, focus on moving the bar as vertically as possible as this will keep your centre of gravity in an optimal position and enable you to lift the most weight possible. Keep in mind though that this mistake may also be due to various mobility restrictions that your body is compensating for, which will be addressed in the next mistake. Excessively arching the lower back is probably the most problematic mistake that lifers make when it comes to this movement. Not only does the literature emphasize that this mistake often leads to acute back injuries and lower back pain, but it’s also been shown to significantly reduce overhead force and your ability to press heavy loads. …which is obviously detrimental to your shoulder development in the long run. So instead, you want to keep your lower back as neutral as possible throughout the lift. But if you’re struggling with this AND you’re not using a weight that’s too heavy for you, then there’s a couple things you need to do. 2. You need to ensure that your body is as stable as possible throughout the movement. Contracting these three muscles before and during the press will provide your body with the stability it needs to prevent your lower back from arching during the press. 2. Work on your mobility in key areas. Hyperextending the lower back is often a compensation for a lack of mobility in other areas. So to improve this, shortly before you begin your sets of overhead press, simply foam roll side to side along both sides of your lats. Do this for a few minutes in order to loosen them up and afterwards you’ll likely notice your press feels a lot smoother and easier to execute properly. Now another problematic area is something called thoracic extension, or in other words your upper back mobility. The higher you raise your arms overhead, the more thoracic mobility is needed to maintain proper shoulder alignment. Therefore, without sufficient thoracic mobility your body will tend to once again compensate by arching your lower back to get your arms fully overhead. After that, proceed to your overhead pressing sets and it’ll likely feel a whole lot easier to get those arms overhead. Another common movement error is excessively bending the wrists during the press. This not only strains the wrists but will limit your pressing strength since the wrists are now at a mechanical disadvantage. Instead, you want to keep the wrists in a neutral position and inline with your forearms as you press. And I find the best grip to accomplish this is something called the “bulldog grip“. If you’ve never used this grip before, you’ll immediately notice that it feels a lot more secure and easier to keep your wrists neutral as you press overhead. During the overhead press your body should be thought of as a stable pillar, with your arms moving overhead to press the weight. However, what a lot of people do, especially when they begin to fatigue, is start to incorporate more of their legs into the movement. 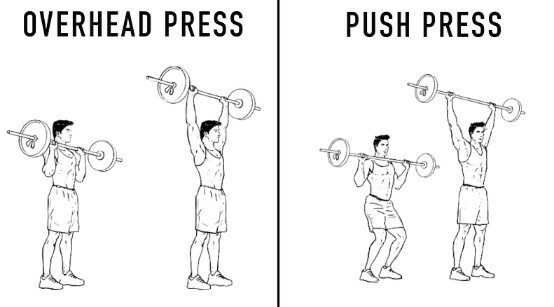 This is done by bending then extending them in order to push up more weight or more reps.
And although this isn’t necessarily a bad thing, it IS a completely different movement and is actually something called the “push press”. This exercise shifts some of the tension away from the shoulders due to the added momentum. Do keep in mind though that performing the push press separately can be an effective way to improve your strict overhead press. But it is a separate movement that involves more of your lower body and less of your shoulders when compared to the overhead press. And therefore, it shouldn’t be used simply as a compensation to lift more weight when performing your strict overhead pressing sets. As I’ve said before, choosing the right exercises is one thing, but performing them optimally and safely is what makes all the difference in the long run. And that’s exactly what’s prioritized in my 4 science-based programs – designed to transform your body not only as efficiently as possible, but also as safely as possible. Check them out if you’re interested in joining the Built With Science family! Anyways, that’s it for this article. Let me know if you have any questions down below and show your support by giving me a follow on Instagram , Facebook , and Youtube where I’ll be posting informative content on a more regular basis! Cheers!